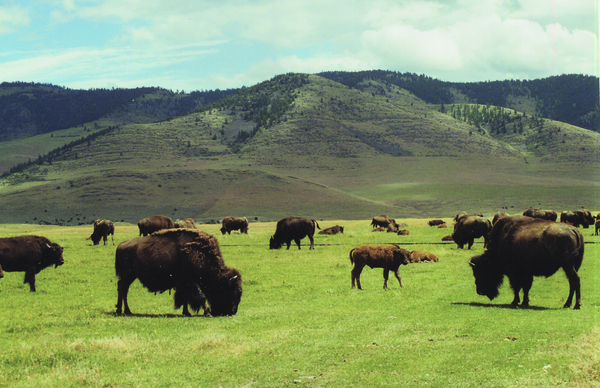 The National Bison Range is administered by the US Fish and Wildlife Service as part of the National Wildlife Refuge System. It was established in 1908 and is one of the oldest wildlife refuges in the nation. A large portion of the 18,500-acre range consists of native Palouse Prairie. Forests, wetlands and streams are also found here providing a wide range of habitats for wildlife. Elk, deer, pronghorn, black bear, coyote and ground squirrels are just some of the mammals that share the area with 350 to 500 bison. More than 200 species of birds also call this home and include eagles, hawks, meadowlarks, bluebirds, ducks and geese. The Range is open from mid-May to the end of October; a small admittance is charged per vehicle. The entrance to the range is off Hwy 212 at Moiese, accessed from Hwy 93 or Hwy 200. Contact: (406) 644-2211 or e-mail bisonrange@fws.gov.